EIGHT PNG Residents have been named in the 19-man Telikom-sponsored national rugby league team for the SP Brewery Pacific Cup tournament in Port Moresby next weekend. The rest of the team comprises overseas-based players. The PNG Kumuls were announced by the chairman of national selectors, Arnold Krewanty, on Saturday night at the Highlander Hotel soon after the Telikom Kumuls Place of Origin clash between the Residents and Internationals earlier in the day at Kagamuga Showground. The selection trial match, whichw as watched by a record 10,000 plus league fans, was narrowly won by the Internationals 24-20.
Notable omissions from the Residents’ side were seasoned campaigners and Agmark NGIP Guria stars Larsen Marabe, Simon Young and George Moni, while Tommy Butterfield was overlooked from the Internationals side. Krewanty said selectors had a hard time trying to put together the team as each player on the day was capable of making the final line-up.He said the team was a blend of youth and experience and selectors were confident that they would do their best against their opponents from the Pacific Islands during the Pacific Cup tournament in Port Moresby. Kumuls coach Adrian Lam said it was the best squad put together for the Pacific Cup tournament despite the absence of English “exports” Stanley Gene and Makali Aizue, who are committed to their club duties in England. Lam thanked Telikom PNG Ltd for supporting rugby league in the country and sponsoring the Kumuls. He said the Telikom Place of Origin clash was the best way to select the Kumuls. He said the Kumuls were generally keen, as he was, to play out of Port Moresby as much as possible and the Kagamuga game was an example, where there was a good turn-out of supporters. 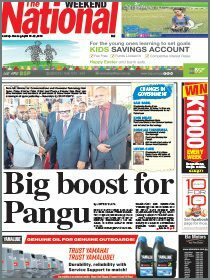 He said next year, they might look at hosting the Place of Origin games at Kokopo in East New Britain. However, Lam said finance and security were two issues to consider in order to bring the game to other parts of the country instead of Port Moresby. The Telikom PNG Kumuls are David Mead, Richard Kambo, Tu’u Maori, Keith Peters, Jay Aston, James Nightingale, Jason Chan, John Wilshere, Tyson Martin and Joe Bond (Internationals), Dion Aiye, Jessie Joe Parker, Rodney Pora, Sigfred Gande, Glen Nami, Charlie Wabo, Menzie Yere and Anton Kui (Residents). Coach Lam would be assisted by Mark Mom. 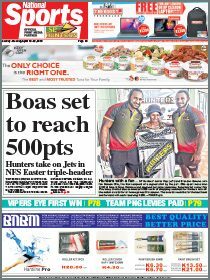 The team travelled by road from Mt Hagen to Madang yesterday where they would be in camp for a few days before retuning to Port Moresby for the Pacific Cup challenge that starts next weekend. Already, the Pacific Cup promises to be the most competitive rugby league tournament in years.